You know those meals you make that taste amazing and make you feel incredible? Yeah, it’s the best. 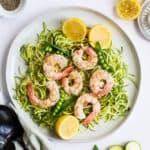 That’s why you must make these easy lemon garlic shrimp zoodles! Not only was I saying, “Mmm… MMMM!” every second bite, but I had so much energy and felt light and satisfied afterword. And they only take 15 minutes to cook! Only seven ingredients total, completely clean and fresh. Honestly, I was bummed about eating really bland and boring meals now that I have to eat gluten free because of my celiac disease. But, spiralizing ALL the things, and seasoning with herbs and fruits like garlic and lemon make EVERYTHING better. Speaking of spiralizers, which spiralizer is the best? I bought this vertical spiralizer because, hello, GRAVITY. To me, it makes sense to spiralize vertically, but the crappy thing is that it doesn’t have suction cups. And it NEEDS suction cups. KitchenAid attachment. This is the most expensive, but it’s electric and works extremely well. And it cores apples and can make things like SWEET POTATO CURLY FRIES. (Haven’t made those yet, but I think I just convinced myself to get the attachment just for those stupid fries, ha!) If you’re investing $25-35 bucks anyway, you might as well put it toward something that saves you time and effort. I think this is a good option if you do A LOT of spiralizing. It’s only $74.99 on Amazon Prime and you can purchase it HERE. Various ladies mentioned that you can get it on sale at department stores, too, for around $100. The Inspiralizer. This is the spiralizer made by Inspiralized, and it came in second place for votes. What’s SUPER cool about this one is that you don’t have to switch out the blades yourself. You simply twist the green knob and get four different noodle shapes. Also, it has suction cups AND counter clamps so it doesn’t wiggle around. It’s a good price point on Amazon for just $34.95. You can purchase it HERE. Paderno. This is the cheapest spiralizer recommended, coming in at $28.99 on Amazon Prime. All of the votes for the Paderno said it does not move around, and has suction cups too! (Why in the world would one design a spiralizer without suction cups anyway? I’m getting too emotionally invested in this.) You can purchase it HERE. But which one would YOU buy, Abbey?! But! If I didn’t have a KitchenAid, or didn’t want to spend $75, I would definitely go with The Inspiralizer because switching out the blades suuuuucks. Does that help? Are we good? Do we feel like we can make an informed spiralizer purchase now? Why are decisions so hard to make sometimes? 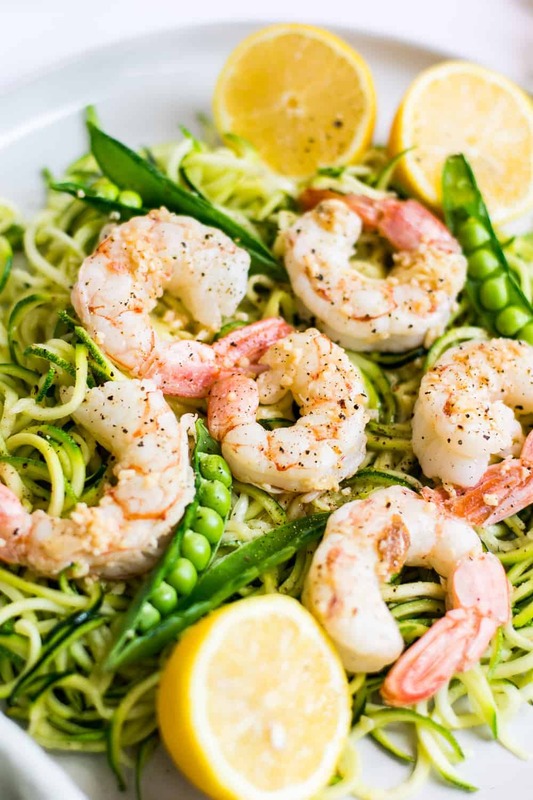 Can we make the lemon garlic shrimp zoodles yet? Lemon and garlic are natural detoxifiers. Both contain high amounts of vitamin C which boosts your immunity, and both contain antioxidants, to help fight free radicals. Get rid of that junk, and make it taste good while doing so! Shrimp is contains over 100% of your needed daily value for selenium. This is HUGE for thyroid health. If you have Hashimoto’s thyroiditis like me, your body doesn’t produce enough thyroid hormone. Selenium is a trace mineral and it is involved in the production and activation of thyroid hormones. It mostly acts as an anti-inflamatory and antioxidant, which is also incredibly important for gut health. Shrimp also contains over 75% daily value for vitamin B12, 50% for phosphorous, and over 30% for choline, copper, and iodine. Basically, we all need to eat more fresh shrimp! I like to buy mine fresh at the seafood counter. Yes, it’s more expensive, but worth it to get the good quality, plus it tastes better. Zucchini is full of fiber and is high in water, so not only is this good for your gut by keeping you regular and hydrated, but full of antioxidants. Also, a study done at the Endocrine Research Unit at Devi University found a link between zucchini consumption and an increase thyroid and adrenal regulation. They linked it to the phytonutrient antioxidants present in squash. Avocado oil is a good fat and helps with nutrient absorption, among many other health benefits. And it’s so easy and yummy to cook with. It’s the only oil I use anymore! 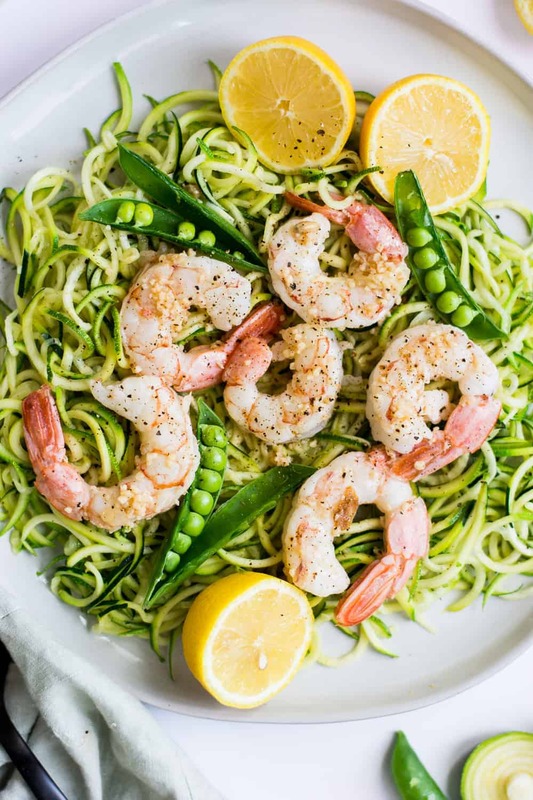 Are we ready for the recipe these easy lemon garlic shrimp zoodles? I think so! Let’s zoodle the dang thing! Grab the recipe below and enjoy! 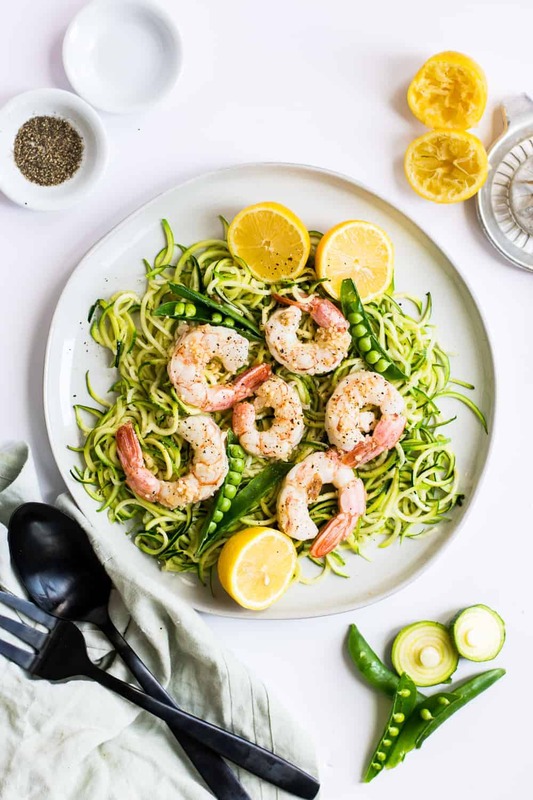 Make these easy lemon garlic shrimp zoodles for an easy and healthy dinner or lunch. It comes together in just 15 minutes, and is packed with antioxidants, nutrients, and flavor. The perfect gut healing recipe! In a large skillet, heat 1 tablespoon avocado oil on medium high heat. 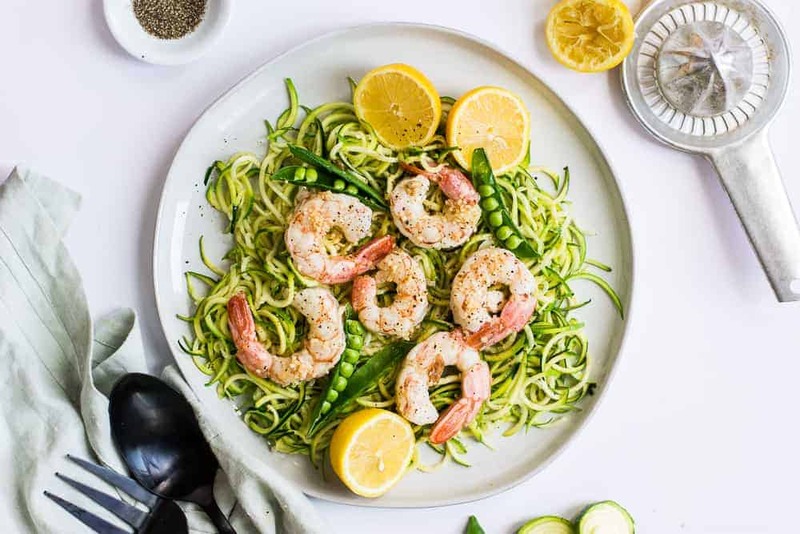 Spiralize zucchini noodles into zoodles. Place the zoodles in the oil, add in salt and pepper, and toss for about 5 minutes until slightly cooked and warm. (I don't like to overcook mine, because I like the texture more firm, but feel free to cook as little or long as you like.) Cover and set aside. In a small pan, heat remaining 1 tablespoon avocado oil. Add in garlic. Place shrimp in pan, squeeze on lemon juice and cook on medium heat in the sauce, about 2 minutes each side. You know your shrimp is done cooking when it forms a "c" shape. Remove shrimp and allow sauce to cook a few minutes longer to develop flavors. 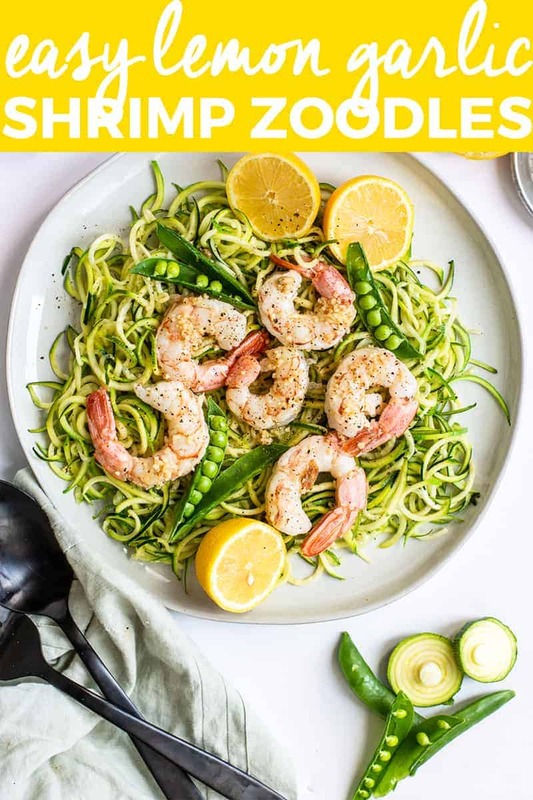 Plate the zoodles, top with shrimp and snap peas, and drizzle with sauce from the shrimp pan. Add an extra squeeze of lemon and salt and pepper as desired. Serve immediately. Enjoy! 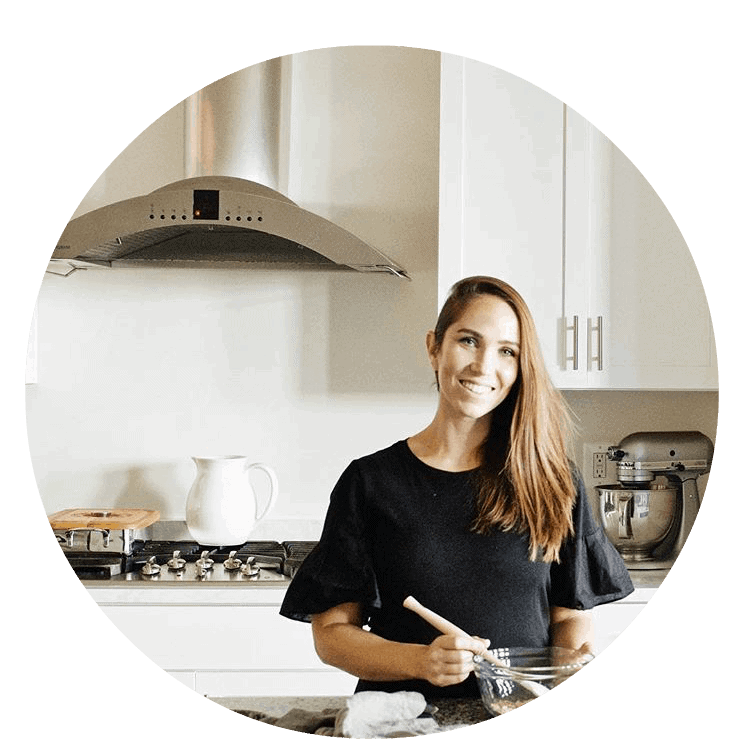 Want more healthy and gut friendly recipes? Check out this avocado ranch ahi tuna poke bowl with mango!